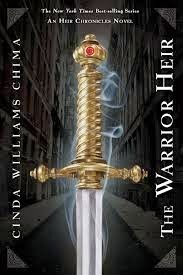 On August 30th, The Warrior Heir by Cinda Williams Chima hit the number 3 spot in the Children's section of the Amazon Kindle store. Cinda is a New York Times and USA Today bestselling author, and she has won a wide variety of awards for her books. The Warrior Heir is the first book of five in The Heir Chronicles series. 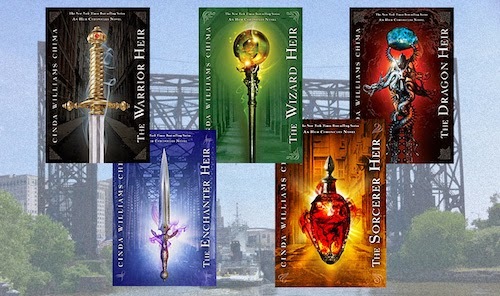 The Heir Chronicles are a quintet of contemporary fantasy novels for teens involving five magical guilds: Warriors, Wizards, Sorcerers, Seers, and Enchanters, collectively known as the Weir. The five guilds hide in plain sight all over the world, although their interguild struggles sometimes spill into the public view. Wizards are the most powerful of the guilds, and have reigned over the others for centuries. This is the story of how all that changed. The Enchanter Heir and The Sorcerer Heir are two late additions to the series, focusing on a group of guild members whose magical powers have been damaged by a magical catastrophe. They are magical mutants, in a way, who persist as shades when they die. Sort of X-Men meets The Walking Dead. All of my novels have been published by Hyperion, a traditional publisher. My forthcoming novel, The Sorcerer Heir, is my ninth. I've been publishing a book a year since 2006. In addition to the five Heir Chronicles novels, I've published a high fantasy quartet known as the Seven Realms series. For me, finding the right agent was the key to attracting the notice of a publisher. The Warrior Heir has been a steady seller since it launched in 2006. As the first novel in the series, sales jump whenever a new installment in the series is released. It didn't hurt that the ebook went on temporary sale last week to promote the launch of The Sorcerer Heir. That's a great thing about ebooks--they make it possible to run a promotion like that. My primary audience is teens, but I also have many adult readers. While more and more teens have access to e-readers and smart phones, I suspect that a portion of my ebook sales go to adults. The great thing about ebooks is that they are so accessible. A reader who finishes one book in a series doesn't have to wait to get hold of the next one. I'm excited about any format that gets books into the hands of readers. I read mostly print novels myself, because I spend a lot of time in bookstores. But I'm happy to read e-books, audio books, print books--just keep 'em coming. Right now I'm working on new novels set in the Seven Realms world. On a normal day, I generally write until mid afternoon, then have lunch and begin working on emails and business. I think it is important for all writers to determine their best writing time and do what they can to spend it writing. The only possible harm I see is the potential for increased piracy by people who fail to realize that what they are stealing is the work that we authors do. That has value, whether you can hold it in your hand or not. Otherwise, it's all good. Learn more about Cinda and her books by visiting her website or by following her on Facebook, Twitter, or Goodreads. See the latest Kids' EBook Bestseller List for more top ten e-format authors and their books. It's updated every Saturday morning. And check back next week when my featured author will be Charlie Holmberg. The Order of the Unicorn, by Suzanne Selfors, hit the number 5 spot in the Kids & Teen section of the Kobo.com store on August 23rd. It's book #4 in her Imaginary Veterinary series. 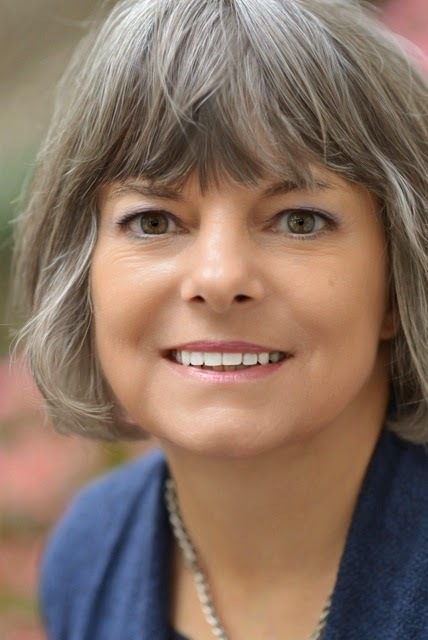 Suzanne is an award winning author with over 20 books written for children and teens. Today she joins us to share about her e-publishing success. First please tell us what your book is about. 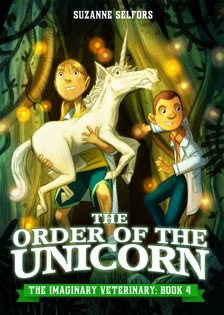 The Order of the Unicorn is about two kids who get to be apprentices to a veterinarian who takes care of imaginary creatures. Thus far, I've been traditionally published by Little,Brown, Walker, and Harper Collins. I started writing in 2002 and my first book hit the shelves in 2007. While I can understand the desire to publish independently, I'm very happy with the traditional model and have no plans to self-publish at this time. Well, I'm really not sure. This is the fourth book in a series and each book has been available in both print and e format. Perhaps it's the amazing cover, illustrated by Dan Santat. You can't discount a great cover! I create an enewsletter that I send to my mailing list--people who've signed up through my website. I use Facebook and just began using Twitter a few weeks ago. I attend library conferences and do lots of school visits each year. My publishers do the rest. Learn more about Suzanne and her books by visiting her at her website or following her on Facebook or on Twitter. See the latest Kids' EBook Bestseller List for more top ten e-format authors and their books. It's updated every Saturday morning. And check back next week when my featured author will be Cinda Williams Chima. 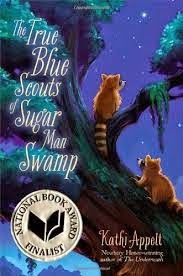 Kathi Appelt showed up on my radar on August 2nd, when her book The True Blue Scouts of Sugar Man Swamp hit the #8 spot in the Children's section of the Amazon Kindle store. Kathi is the author of over twenty books, ranging from picture books through to young adult. She has won many national and state awards for her writing, too many to list here. You can see her press page for full details. I had the honor of meeting Kathi and hearing her speak at the 2011 Highlights Writers Workshop, so I was especially delighted when she answered my request for an interview. Enjoy! Tell us what The True Blue Scouts of Sugar Man Swamp is about. A swamp is a hard place to love. It’s filled with all sort of biting critters and stinging vines. But it’s also the home to thousands of species who need its tall trees and slow-moving bayous to make their nests and raise their babies. Our swamp, the Sugar Man Swamp, also the home of a mysterious creature known as . . .yes . . . the Sugar Man, is under attack. It’s up to the raccoon brothers, Bingo and J’miah, to stop a family of marauding feral hogs from mucking up the sugar cane that grows in abundance. And it’s up to 12 year old Chap Brayburn to stop a greedy developer from turning the whole thing into a theme park. Will they succeed? Will the Sugar Man wake up? Read it to find out. I attribute enthusiasm for the book to all those librarians who have championed it, along with booksellers and others. I have a Facebook page, and a website: kathiappelt.com. My ideal audience is between 7 and 12 I’d say. However, I hope I’ve spun a tale that anyone would enjoy, not matter what their age. I’m enthusiastic about e publishing. While there’s hardly anything I love more than a beautiful bound book, I appreciate any form of media that gets my work into the hands of my young audience. I’m not sure I’ve been in it long enough to say. I made a commitment years ago to always write at least 5 minutes each day. I’ve never broken that commitment. As we speak, I’m in the early stages of a new young adult novel. Well, I think it’s going to be young adult. I’m not sure yet. Gosh, I have no idea. I never thought we’d be where we are today in e-publishing, so no telling what we’ll see in five years. Learn more about Kathi and her books at her website or by following her on Facebook or on Twitter. 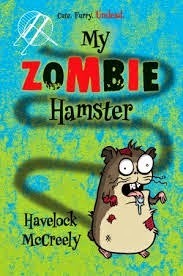 My Zombie Hamster by Havelock McCreely hit the number 9 spot in the Kids and Teen section of the Kobo.com store on August 2nd. Havelock joins us today to tell about his path into the top ten. First, please tell us what My Zombie Hamster is about. It's about Matt Hunter, a kid expecting the latest in computer game peripherals for Christmas, who instead gets saddled with a hamster called Snuffles. Who dies. Then turns into a zombie. (The Anti-Snuffles.) Anti Snuffles tries to take over the town by turning all the other pets into zombies and recruiting them into his zombie army. Matt and his best friend, a girl called Charlie, have to stop them before the outbreak is traced back to Matt's family. Traditional in this case. Nothing against indie, but I don't think MG sells well without the strong backing of a good publisher like Egmont. The humor and the heart. I love comedy, and I love writing it, but you need a little heart as well. Something (or someone) for the readers to identify with. So far it seems to be word of mouth and sites like EbookBestseller. I do have a Twitter account (H_McCreely) and have it open all day, so if anyone wants to come over for a chat I'll be there. I think anything that gets kids reading is a good thing. I don't know the study itself, but I don't really see how kids would be comprehending less of what they read. Reading is reading. I've always been excited about e-publishing. It's a new arena for writers to break into. I find myself reading more and more on my e-reader nowadays. About 90% of my purchases are e-books. Mmm... hard one. I don't think so. I think it will even out. I still think kids prefer the feel or real books, and parents still prefer buying real books for their kids. That might change, but I think it will take longer than 5 years. Helps. Definitely. The ease of instant purchase is a huge benefit. Learn more about Havelock McCreely by following him on Twitter or on Facebook.